GE dryer error code shows up on the digital display? These diagnostic fault codes explain what is wrong with your GE dryer. The error codes will assist you to diagnose the part that may be needed to be checked or replaced. 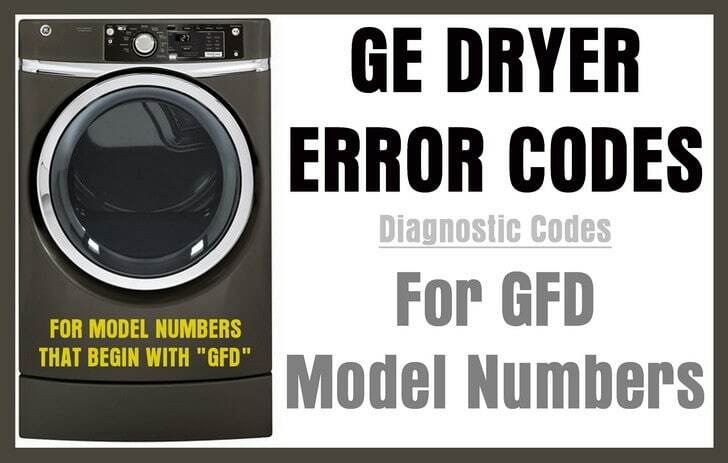 The GE dryer errors below are for model numbers that begin with “GFD”. 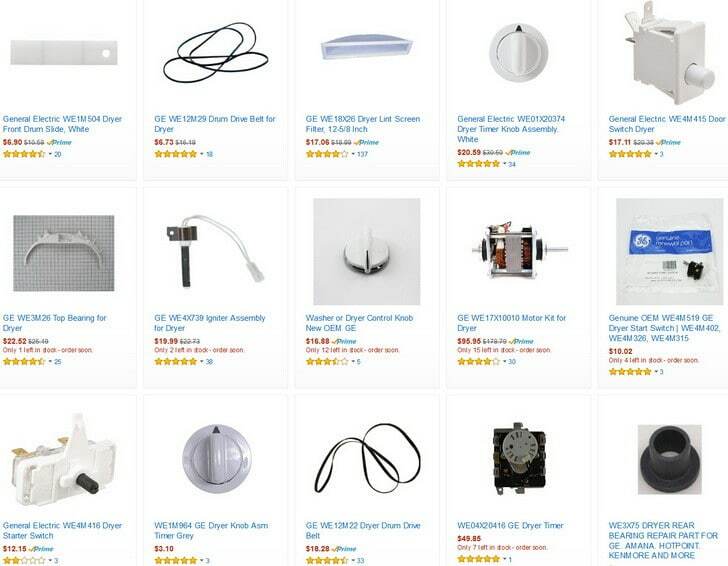 When you find the problem or part that needs to be replaced, here are replacement parts for your GE model “GFD” Dryer. Check and or Repair = Remove power from the dryer. Connect any loose wires on the inlet thermistor. If the wire harness is damaged it must be replaced. If you find the wire harness in good condition then replace the inlet thermistor. Check and or Repair = Remove power from the dryer. Connect any loose wires on the outlet thermistor. If the wire harness is damaged it must be replaced. If you find the wire harness in good condition then replace the outlet thermistor. Check and or Repair = Remove power to the dryer for 5 minutes. This may reset the main control board. If the reset does not work then replace the main control board if the error code comes back. Check and or Repair = Try to free the stuck button by pushing each button. If the error code does not reset then unplug the dryer and troubleshoot any damaged or loose control panel parts. If the control panel is working then replace the main control board. Check and or Repair = Neutral “N” and the Line 2 “L2” are reversed. Rewire the power cord connections on the terminal block at the back of the dryer. Use your manual if needed to follow the correct install instructions. Check and or Repair = Remove power to the dryer. Re-secure loose wires on the door switch. If the wire harness is damaged it must be replaced. If you find the wire harness in good condition then replace the dryer door switch. Check and or Repair = If the dryer motor will not run remove power to the dryer and and re-secure any loose wires found on the motor. If the wire harness is damaged it must be replaced. Check all drive components that may be preventing the drum from turning. If the wire harness and the drive parts are in working order then replace the drive motor. NOTE: If the motor will not turn off (besides removing power from dryer) then replace the main control board. There may be a stuck or bad relay on the main control board which may supply constant power to the motor and therefore keeps the motor from turning off. If your GE dryer error or fault code is not listed here or you need assistance with an error code, please leave a comment below and we will be happy to assist further. GE dryer won’t work and has E6 on screen.